When I was in ceremony last November in the Amazon for 2 weeks, the times that I was deeply connecting with the Otherworld, I would hear Mongolia. I say hear, because I would hear something that sounded like throat singing or a deep guttural prayer coming from seemingly inside the earth. It was almost all I could hear. It seemed like a prayer that was going into the cosmos. A prayer for Earth. After I left the Amazon in Peru, I continued to hear the prayer in different ways. And then it intensified. As though Mongolia was filling my psyche. The message from Spirit was undeniable. So I began responding. It became evident they wanted me to bring a group of women there. What would we be doing there? We'd be connecting with the people of medicine, particularly the Shamaness. What would be happening? We don't know. In my experience with Spirit, when I receive the calling, I respond. With trust. Remembering the documentary that I watched many years ago, The Horse Boy, I felt called to revisit it. 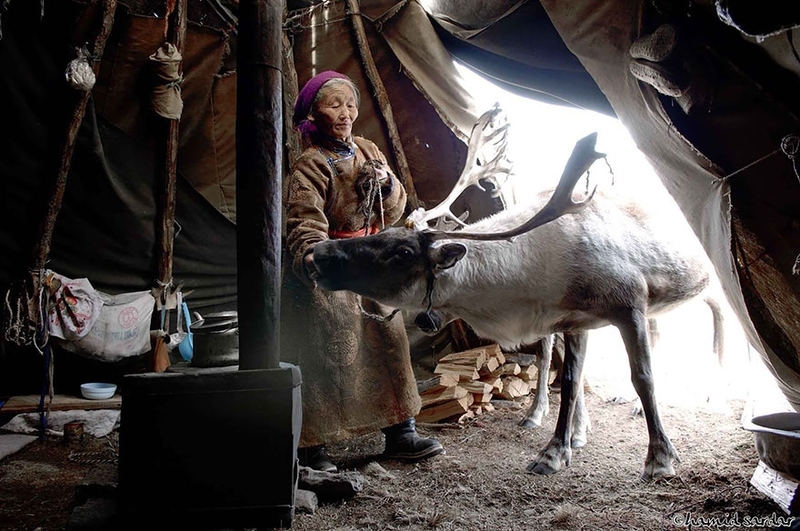 I watched the film again and then it ignited my desire to journey to the Dukha Tribe, the nomadic Reindeer People. On seemingly a separate path, Kontomble have been requesting a documentary for the last year at least. What about? The Little People. The little people of the Earth. A story that I feel that they've been telling through the expression of my life. I was waiting for the clear sign of who would be sharing that story through documentary (in other words, the film maker) and that sign arrived. She arrived. It seems that these paths are going to converge in Mongolia this August. A documentary is going to be created. And heart-centered still photography will emerge as well. As far as I can sense so far, it's a story about the Earth. It's a story about the Little People. It's a story about the rise of the feminine. It's a story about you. And it's a story about me. It's a story about us. The us that is in creation currently. So please know if you are journeying to Mongolia with us, you are a part of the telling of that story. You'll know if it's right for you. I believe that to be true. Our journey will be for 15 days. We will begin in Ulaanbaatar and then we will start traveling north. 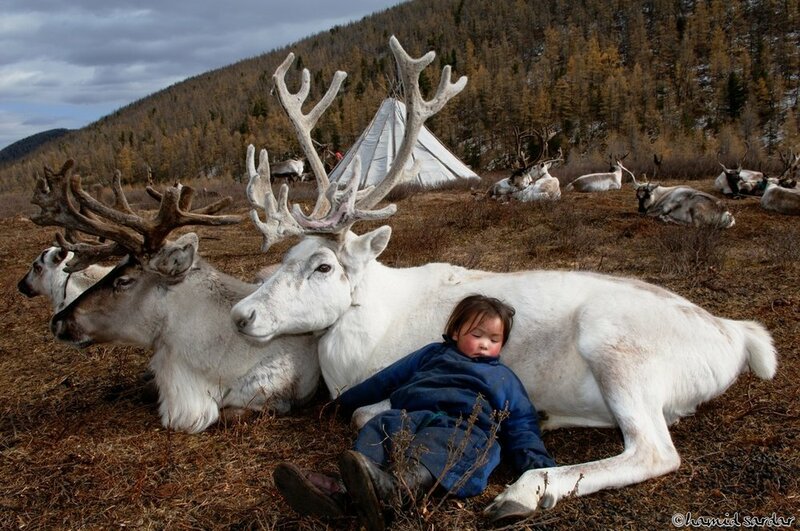 We will ultimately be traveling to spend time with the Dukha Tribe, nomadic people deeply connected to the reindeer, in the northern region of Mongolia called Ulaan Taiga. We will travel in cars, on horses, and on domestic plane flights. Along the way, we will make offerings, spend time in nature and at healing waters, connect and process as a community, and connect with the Kontomble in council and ceremony. We will also have the opportunity to sit in ceremony with Shamans and the Dukha people to learn about their way of life, herbals medicines, and shamanic practices. When we are with the Dukha, we will be immersed in their village life and hosted in their homes. We feel very blessed, humbled, and honored to be welcomed into their village and to experience the hospitality and spirit of generosity they so cherish. We will sit with a Shamaness for a ceremony as well. This journey is a pilgrimage; at least part of each day will be spent traveling. We will be sleeping on land and sitting with sacred and ancient beings in a place where the animals and the other living beings are protected and honored. We will be pitching our tents most nights. At times, we will also carry all that we bring with us on our backs. The weather can be unpredictable and oftentimes cold. Part of the experience will also be trying new foods as we will be eating what is available and made for us with many recipes coming from traditional Mongolian culture. Essentially, while we are journeying, we will be letting go of modern comforts and immersing our full beings in the experience. This journey will be challenging. It will likely stretch us each in our own way, to make room for growth, healing, and greater wholeness. But we will also be within in culture, land, and an experience that is deeply sacred, precious, ancient, and profound. This pilgrimage is an open and safe space for all that identify in some way as feminine or female. It is not she/her exclusive and we welcome all expressions of what feminine means to you. We will be guided by a leader that can translate for us, someone that also knows the people and the land well. The journey is based on the trajectory that the family took in the documentary called The Horse Boy. It will also be with the same company and the same guide. His name is Tulga. Preserving the ecosystems and culture is at the heart of what Tulga and his company do. They are also committed to sustaining balance and being mindful of the impact of this type of travel on the land, the villages, the people, and the varying traditions. *International flights and transportation to and from our meeting space in Ulaanbaatar will not be included. There will also be one night spent in a hotel and the meals at the hotel will not be included. *You will be required to take horseback riding lessons and commit to some sort of physical training and emotional, energetic, and spiritual support regimen before arriving in Mongolia. These will be your financial responsibility as well, though we encourage you to find the right fit for your being and truth, whatever that may be. As there is only space for a select group on this pilgrimage and it will entail in challenging and dynamic experiences, each participant will need to apply for a space. Upon welcoming to the journey, you would receive a registration form, a liability waiver, a healing agreement, a photo release form, a payment policy to sign and return completed to our team. These forms will be due within 72 hours and you would commit to a date you will send in your deposit at this time. After these steps are completed, your space would be officially reserved. We would then connect more deeply about how to prepare for the journey and will begin to come together for community calls. To reserve your space, a nonrefundable deposit of 500 USD will be required within two weeks of acceptance to the pilgrimage. The remaining payment will be due before the journey takes place. Personal payment plans will be set up at the time of registration to help make the financial aspects of the experience more accessible. For more information, please feel free to reach out to ancestorbridgeteam@gmail.com.